Theater District Station Platform Art - Sprawl "On Stage"
There are a lot of things that the Metropolitan Transit Authority of Harris County (METRO) is doing right. They're about to launch new rail lines that extend through Downtown Houston, as well as into the city's East End and Third Ward, reaching Texas Southern University and the University of Houston. METRO is also conducting a much needed Transit System Reimagining campaign, redrawing bus routes from scratch and reallocating resources to better serve most of the residents of Houston. I've previously covered how some of the routes would change, and analyzed how the proposed reimagining would affect my daily commute. METRO board member Christof Spieler has also explained that "This is a plan that makes current METRO riders’ trips better and makes METRO an option for more people." In my commendation of METRO however, there are things from time to time that make me stop and think. One case is probably much-a-do-about-nothing, but I was surprised to see the word "sprawl" included in the design of the Downtown Rail Theater District Station. 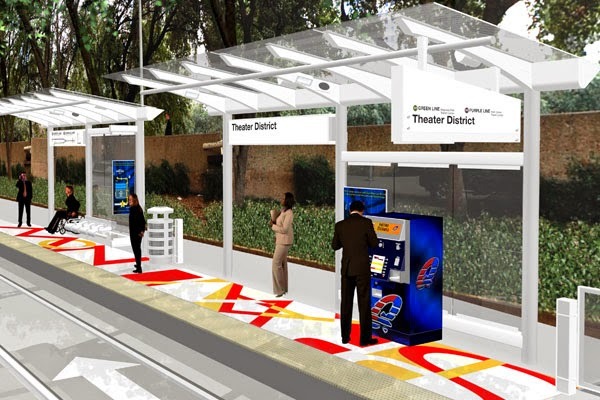 The renderings of the platform were released some time ago as part of the METRO's Arts In Transit Program. The art created by Sharon Engelstein and Aaron Parazette contains "arrangements and rearrangements of context-specific words: vital, space, pivot, spirit, booming, go, core, cool, boost, sprawl, energy, smart, rapid, trade and now." Whether these terms are intended to represent Houston cannot be gathered from METRO's details about the project. The words selected by Engelstein and Parazette will be divided between Central Station Rusk, Central Station Capitol and Theater District stations. "Sprawl" is the only questionable word of those selected in the art, as all of the others have a positive tie to Houston. But "sprawl" is one word that strikes the nerve of most urbanists and urban planners around the country. It's also a bit comical that the very service that is being provided in rail transit will most likely never serve those that are contained in the sprawling land of Houston. Had the artists selected a word like "dense" or "solid" or "grow", they might not seem so out of place. It also seems that the orientation of the words has changed, readable from the street from left to right, as opposed to on the platform itself from left to right as shown in METRO's originally renderings. There are also now four words, as opposed to the rendered three words in the platform of the Theater District Station, eastbound Rusk at Smith. If there's anything that Houstontians are trying to shake, it's the image that Houston is a giant wasteland of suburban sprawl. Houston is much more than that, granted we do have a sprawling landscape, and it does, and will continue to present challenges to our city. I am sure this is making a mountain out of an ant hill, but it seems like an odd selection to have highlighted among other words that may used to describe Houston. The Houston BCycle program has done an admirable job at locating a few of their docking stations near the METRO Rail along Main Street. By my count, there are 11 BCycle Stations that are within a three block walk of the METRO Rail Red Line along Main and Fannin Streets, with six of those being one block or less from the Red Line. This makes for great mobility for visitors or those that do not own a bike. For those that own a bike, the BCycle system may not be as practical. 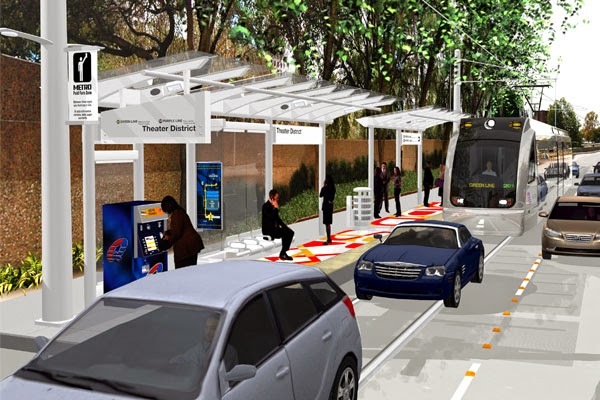 What about areas that are without BCycle stations, but still have access to the METRO Rail line or connecting bus routes? What are riders to do with their bikes when commuting from their homes or places of work with their bicycles? The METRO Rail currently only has bicycle storage options at the Fannin South, TMC Transit Center, Wheeler and Downtown Transit Center stations. That seems surprisingly low, especially considering the amount of design that took place for each station and the consideration of the Transit System Reimaging. 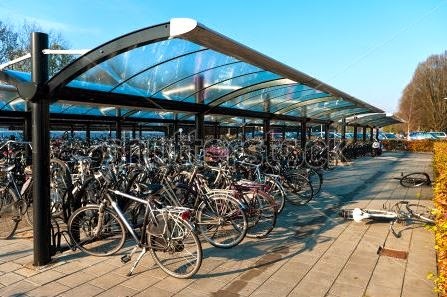 With a shift in bus routes, it may be more feasible for those within biking distance of a rail station, to simply ride their bike to that station. However, once you get there, what is one to do with their bike? During a few recent trips I noticed a bicycle locked to the station platform at the Cavalcade Red Line station. METRO itself even admitted that no, the standing rails at the station are not intended to be bicycle racks. Given there are no bicycle racks here or at many other stations, and that bicycles are technically prohibited from being transported in the rail cars during rush hours (from 6:30 AM to 9 AM, and again from 3 PM to 6 PM), it leaves one with a transit conundrum. The answer is, "I'm going to lock this up at the station so I can ride it back home when I am done with my workday." All this to say, if we are going to advocate for Complete Streets and transit oriented development, there needs to be a consideration about those that must walk or bike that extra connection to their residence or place of work. 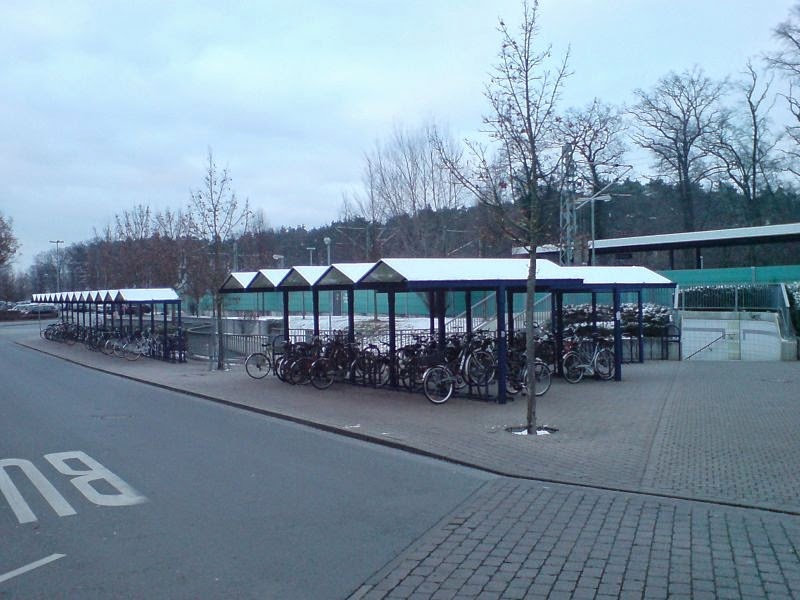 Simply adding bicycle racks at stations may provide some assurance to riders that they can secure their bicycles in a designated area. As METRO shifts their bus routes around altering service for many, there may be increased demand for rail lines, with some people choosing to bridge that gap between the beginning and end of their trips, with a bicycle ride. @chrisandrewsCDA @MetroRailNorth Apologies for the delay in responding. No, these are not intended to be bike racks. METRO's bicycle boarding on bus routes rose by 47% from January 2013 to January 2014. That's a significant spike, and with the increased access to rail, it's not too much to think that bicycle boarding will increase on rail lines as well. It's an opportunity for METRO to start thinking a bit bigger about transit oriented development, and consider some additional amenities to rail stations to accommodate Houston's increasing density and desire for public transit. Stop! Before you jump in and purchase your new model train you better first learn the differences between scale sizes. Knowing the different scales will help you decide: which scale model railway will fit in the space you have available, which sizes are easier for you to work with (large or even arthritic fingers do not match well with smaller scales), which scales have the most choices for accessories, what model train scales will fit your budget, how realistic and authentic do you want your railroad to be. Below are the 7 most popular model trains scales. I have listed their pros and cons to help you understand which scale are the best match for you.